The Valley of Flowers lies deep in the Garhwal Himalayas, and is covered with snow for at least six months of the year. When the summer heat melts the snow, the ground soaks up all the water, and puts forth glorious blooms in the months afterwards. The best time to visit is in July and August, when the rains have begun. During this time, new flowers blossom every few days covering the slopes in flowers, and the waterfalls and streams are full. • Visit the iconic Valley of Flowers in Uttarakhand. • See a variety of colourful blossoms across the slopes of the valley. • Cross streams and stop at waterfalls. • Do an easy trek that takes you deep into the natural beauty of the Himalayas. For cancellations made more than 24 days before departure of the Valley of Flowers trek: 95% refund. For cancellations made 14-24 days before departure of the Valley of Flowers trek: 70% refund. For cancellations made 10-13 days before departure of the Valley of Flowers trek: 50% refund. For cancellations made 0-9 days before departure of the Valley of Flowers trek: No refund. You'll be picked up at Haridwar Railway Station at 07:00 hrs, and will board vehicles to Joshimath. It's a long drive of about 250 kms, which will take you at least 8 hours, but it's a beautiful drive. En route, you'll pass Rishikesh, and the confluences of rivers at Dev Prayag and Rudra Prayag. You'll reach Joshimath late in the evening. Here you'll check into a hotel and will spend the evening exploring Joshimath. Overnight at Joshimath in hotel. Trek to paradise - Valley of Flowers. Today after breakfast, you'll be driven in a bus to a the small village of Pulna near Govindghat, which is the start point of the trek. You'll begin the trek here and head towards Ghangaria. Almost immediately, you're in the middle of greenery, with waterfalls to admire, streams to cross, and flowers dotting the landscape everywhere. Overnight at Ghangaria in hotel. Today after breakfast, you'll set out for Hemkund Sahib. This beautiful gurudwara lies along an icy lake, with seven peaks surrounding it, and a river emerging from the lake. It might be crowded at the gurudwara, but the rest of your trek is serene and peaceful. By evening, you'll return to your hotel in Ghangaria, where you can relax for the rest of the evening. Overnight at Ghangaria in hotel. Snow-capped mountains on the horizon. Day 4 of the trek to Valley of Flowers: Day visit to Valley of Flowers! Today you set off to explore the Valley of flowers. It's a fun day of trekking in the valley, visiting the best view points. The mist rolls in every now and then, the mountains surround you, and the whole valley is yours to explore. Return to the hotel in the evening. Overnight at Ghangaria in hotel. Trek through lush meadows and grasslands. Today you'll begin your descent to Govindghat, where vehicles are waiting to pick you up. It’s a 14 kms trek, but will take about 3 hours as it's all downhill. You'll stop to visit Badrinath, and then proceed to Joshimath. Please note that a visit to Badrinath is subject to good road and weather conditions. A final call will be taken by the trek leaders on the day of the visit. Overnight in hotel in Joshimath. Breathtaking scenery en route to the Valley of Flowers. Today you'll check out after breakfast. You'll be driven on to Haridwar where you'll be dropped off at the railway station. Trip ends here. You'll spend the night at Hotel Kamet or similar hotel in Joshimath. You'll be staying in deluxe rooms with attached washrooms on a triple-sharing basis. Today's meal package includes only dinner. However, you may visit any of the restaurants en route to Joshimath to have meals at an additional cost. 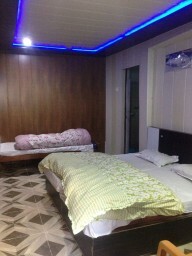 Stay in Hotel Kamet or similar in Joshimath. 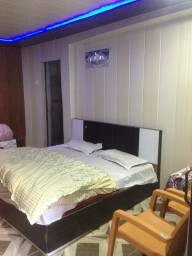 You'll spend the night at Deepak Guesthouse or similar hotel in Ghangaria. You'll be staying in deluxe rooms with attached washrooms on a triple-sharing basis. Today's meal package includes breakfast, lunch and dinner. Please carry a lunch box for packed food during the trek. All meals will be vegetarian. 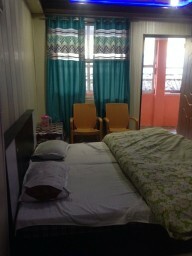 Stay in Deepak Guesthouse or similar in Ghangaria. You'll spend the night at Hotel Kamet or similar hotel in Joshimath. You'll be staying in deluxe rooms with attached washrooms on a triple-sharing basis. Today's meal package includes breakfast, lunch and dinner. Please carry a lunch box for packed food during the trek. No meals are included in today's meal package. However, you may visit any of the restaurants en route to Haridwar to have meals at an additional cost. You can reach Haridwar by rail from Delhi, Mumbai, Lucknow, and other destinations. You can also fly to Dehradun airport which is about 48 kms from Haridwar. The operator will arrange your transport from the station to the start point of the Valley of Flowers trek.